Why are the Dead Sea Scrolls so important to the study of the Bible? Learn why with Dr. James Fleming on the show Christ in Prophecy. Last aired on February 3, 2013. Dr. Reagan: Many experts consider the Dead Sea Scrolls to be the most important archaeological discovery of the 20th Century, if not the most important one of all times. Why are they so important? And what are some other archaeological discoveries that have also proved important from a biblical viewpoint? Stay tuned for an interview with one of Christendom’s best known teachers of Biblical Archaeology. Dr. Reagan: Greetings in the name of Jesus, our Blessed Hope and welcome to Christ in Prophecy. Once again this week I am delighted to have as my special guest, Dr. James Fleming who is considered to be one of the most significant teachers of Biblical Archaeology in Christendom today. And my colleague, Nathan Jones and I are going to be interviewing him about the Dead Sea Scrolls. But Nathan first of all I’d like to ask you a question, and that is that last week we had such a fantastic interview of Dr. Fleming about the importance of Bible Prophecy, not Bible Prophecy but Biblical Archaeology that I want those who missed it to know how they can see that on the internet. How can they view last week’s program? Nathan Jones: Well certainly, just go to www.lamblion.com, every single page at the bottom of the page there is a big bottom that says TV shows, click it, it will take you right to the show, or in the menu click multimedia television programs. Dr. Reagan: Folks, on the wall behind me you see a photo of one of the most famous sites in all of Israel, it is called Qumran, it is located near the Dead Sea. And at the top of that barren hill are some caves where the Dead Sea Scrolls were found in 1947. Nathan Jones: Dr. Fleming, could you tell us the fascinating story behind how the Dead Sea Scrolls were found, and why they are significant. Dr. Fleming: In the winter of ’46-’47 in the 1900’s a Muslim shepherd boy of the Ta’amireh tribe was with his goats and one of them went up into a cliff, and to get the goat to come down he tossed a rock into the entrance of a small cave. And the rock went clunk, instead of clack, it hit something hollow. Being curious he went up inside and sure enough there was this tall pottery jar that had broken and inside, he thought he would either find gold, this dirty blackish rolled up leather, which we now realize was animal skins, some of them were sheep, some even cow skins. He put three of then in his satchel, carried it back to his head of their tribe who thought maybe they could be sold and used for leather for making shoes. Now listen to this; he went to a shop in Bethlehem, listen to the providential name of this shop, Kando’s Shoe and Antiquity Shop. Thank the Lord because Mr. Kando noticed faint Hebrew letters on the backside of the scrolls, and therefore they weren’t–wouldn’t it have been amazing having Bedouins wearing Dead Sea Scroll sandals if they hadn’t been properly found? And even then they weren’t sure on the significance of them. But this was right at the eve of the War of Independence between Israel and the surrounding Arab nations. And Mr. Kando was a Syrian Orthodox Christian and he gave them to their Archbishop who was going to go to the US and thought maybe they could be sold because the community was really needing help financially. And an ad appeared in the “Wall Street Journal” Dead Sea Scrolls for sale, would make an ideal gift to your church or college. Fortunately a scholar saw that, reported it to Yigael Yadin the son of a famous archaeologist named Sukenik who arranged to buy them through an intermediary so they would be going to some Jews at the time, so most of them ended up in the Israel Museum in Jerusalem, so what a fascinating saving. Dr. Fleming: There can be no doubt as to their authenticity. I would guess by the script they are about mid-First Century AD, which is exactly on target. Dr. Reagan: Now were additional scrolls found? Dr. Fleming: Several caves, the same tribe thought they could make more money, were found. They are numbered in their sequence of studies, 11 caves ended up with scrolls in them. But caves one, two, and three produced these first ones that were mentioned in that identification of Albright. Cave four was actually found after an excavation of the closets archaeological site Qumran which you mentioned. Cave four is the one we have pictured behind us on the wall here. That ended up being scrolls that were not in jars. And so they ended up in 40,000 pieces. Dr. Reagan: Well I also understand that when it became known that these scrolls were valuable that the Bedouins began to tear them into little pieces. Dr. Fleming: Yeah, they found they could get more, in their ignorance. But in these first scrolls that were sold for peanuts at the time. Dr. Fleming: About one-third, all together there were almost 1,000 scrolls, many of them only small fragments remained. Of the 1,000 original scrolls a third were Hebrew Bible, Old Testament text. Nathan Jones: Minus what two books right? Esther and Nehemiah was it? Dr. Fleming: Yes, but that is a little bit tricky because a couple books tend to be 1st and 2nd Samuel on the same scroll you know. So a part of 1st and 2nd Samuel is found but the piece was only from 1st Samuel, right, that kind of things. Nathan Jones: So these are Old Testament books then that were discovered, what, hundreds of years before our existing copies. Dr. Fleming: So these all are from about the 2nd Century BC, Qumran destroyed in 69 AD. Dr. Reagan: Now, explain, what is the significance of finding scrolls that old? Dr. Fleming: Well, we had to just trust that the Jewish scholars, called the masoretes did a good job discerning which of the scrolls, the old scrolls that they had in the 800’s AD which of them were more accurate. Dr. Reagan: So you are saying the oldest scrolls we had before this were dated to 800 AD. Dr. Fleming: No, in 800 AD the various scrolls we had, and several scrolls were probably going back almost to the 1st Century. But because errors had begin, copies errors were in some of them, they didn’t want any of those to be copied, so after they determined which they felt were the more accurate the others were not destroyed, but buried, so none survived until this discovery. Dr. Reagan: So this took us back 800 years? Dr. Fleming: And some of those, one at Qumran is probably from 300 BC, so between 800 and 1,000 years. Dr. Fleming: Almost complete, only a few words missing in a few. The three most common books, for which they needed more copies because they were used more frequently, are the same three that Jesus quotes most often from. Dr. Reagan: Okay, what are they? Dr. Fleming: Isaiah, Psalms, Deuteronomy. And those were felt to be more practical use and therefore more synagogues had them. Dr. Reagan: The copy of the Isaiah scrolls is the centerpiece of the Dead Sea Scrolls Museum. Dr. Fleming: Yes, but between a dozen and 15 copies were found of those 3. Dr. Reagan: Now let’s go back to the question I asked you earlier. What else besides Hebrew texts were found there? Dr. Fleming: About one-third were inter-testamental books that we already knew about. Dr. Fleming: This would be 1st and 2nd Maccabees, Jubilees, some other books know as the Apocrypha today, not felt to be as old as the Hebrew Bible books, therefore not chosen by the Jewish scribes to be part of what they consider the canon. Dr. Reagan: Were the rules and regulation? Dr. Fleming: Yes the Manual of Discipline, or the rule of the community. Dr. Reagan: So who is this? Who did this? Dr. Fleming: That’s the big question. That is the big quest. The word Essenes is not found in the Dead Sea Scrolls. The word essenes is hasidim we get the word hasidic from it. It simply means the pious ones. And you should not be surprised, they’re not going to call themselves the pious ones. Well we all know what pious people call themselves, but it is a title used by others. They simply call themselves the Yahad which means the community. So scholars are usually cautious, they call them they are written by the Dead Sea community. But when Josephus described the varies kinds of groups in his day called them the sects, the four sects he describes Pharisees, Sadducees, but you have the Essenes listed and he gives four pages about what the Essenes believe and it is very close to the Manual of Discipline, the rules for their order. Dr. Reagan: So is it your personal opinion that the Qumran community did produce these scrolls? Dr. Reagan: Because some believe that they were taken from the Temple in Jerusalem and hidden there. Dr. Fleming: There is one cave, cave three that only had scrolls that related to the Temple. Dr. Fleming: So that cave maybe a different origin. But they are the same carbon 14, the same kind of scrolls, the same kind of jars, etc. Dr. Reagan: Now, what about the scrolls, what do they say about the authenticity of what we have today as the Bible. Dr. Fleming: The Masoretes did a good job, determining which were the more authentic ones. There are small errors, small conflicts, like spelling of a word, things like this. In one of the Psalms we have each verse starting with a different letter, acrostic kind of thing, “n” is missing, the Qumran had the “n” left out, you know things like that. But not one case where there was any theological difference. 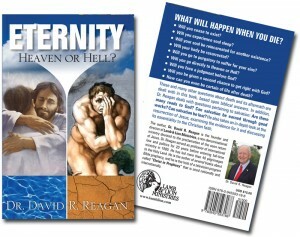 Dr. Reagan: Well, it is amazing testimony to the preservation of God’s Word. Dr. Fleming: Yes, and also why the Bible should not be punished simply because it survived as an ancient source. It also helps us know that the Greek translation from the 3rd Century BC called the Septuagint was very good on the first five books of Moses, very similar to the Dead Sea Scrolls on it too. So what is interesting is that some of the books were in Greek, some in Hebrew, some in Aramaic. What really helps a modern scholar, if you have three translations of the same verse to make an English translation. What words did they use? It can give you some nuance to choose an English word you see. So now days it is very important for the serious Christian student to have a translation that will have some footnotes and that will let you know the translation team also considered some of the insights that come from the Dead Sea Scrolls. Dr. Reagan: Now for many years scholars sat on the scrolls, and they were very covetous of them. Dr. Reagan: And they wouldn’t let anybody see them. Dr. Fleming: I would love to give you a good answer. Dr. Reagan: I know that Biblical Archaeology Review was very involved in trying to break that open. Dr. Fleming: Actually I am proud to be on their advisory board, the problem was this: the original division of these scrolls was not given to as many scholars as it could. Instead of 50 it should have been a couple 100, so some scholars had many scrolls and they became jealous as though it was their property. It’s the world’s property, they should have given them to their promising graduate students, but then their name gets with the translation and not mine. Dr. Fleming: And it was decided that we should open up the archive and even though the scholars hadn’t published some of them, the photographs were made available to other scholars. Dr. Reagan: And how much is there that has not been translated yet? Dr. Reagan: So all has been translated. Nathan Jones: That means then that the Bible I have today is inerrant, in other words there is no errors in 2,000 years, we can go back 2,000 years and trust that our Bible’s today are accurate. Dr. Fleming: Yes, these minor things like spelling, and stuff like that would be different, yeah. Nathan Jones: But the theology. Dr. Fleming: But of no theological importance. Dr. Reagan: Well that’s amazing. What an amazing story of a shepherd boy who throws a rock. Dr. Fleming: That went clunk, instead of clack, yes. And that he was curious. And that even the non-Biblical books gives us use of those words in other sentences. Dr. Reagan: Can just an average individual go and see the Dead Sea Scrolls today? Someplace where you can see them? Dr. Reagan: That is in Jerusalem. Dr. Fleming: –in Jerusalem, some of the scrolls ended up in Jordan and they would be in Amman, Jordan. Dr. Fleming: And the fragments that have not been pieced together, now it is down to about 27,000 I think, I am not sure. Nathan Jones: They went on tour recently too, right? Dr. Fleming: And there is enough, you don’t want all of them on display at one time, cause you want to actually keep them in darkness. And rotate how many you bring up to light and have that with dimmed light and stuff. But yeah, they have been on traveling expeditions which is great. Dr. Reagan: Thanks for sharing that fascinating story with us. Dr. Reagan: Welcome back to our interview of Dr. James Fleming who is one of Christendom’s best known teachers of Biblical Archaeology. Jim I would like for you to share with us two or three other major archaeological discoveries of the 20th century. We have talked about the Dead Sea Scrolls. Dr. Reagan: But what about some others that may have impacted our understanding of the Bible? Dr. Fleming: May I focus it on an area because there are so many discoveries, there would be a few that relate to the life of Jesus. Dr. Fleming: So that certainly has to be it. The man who donated the money for the Corinthian bronze gate to enter the temple, called the Nicanor Gate there was a tomb found in the Mount of Olives, Nicanor who gave the temple gate. So isn’t it interesting that we have these contact points with the life of Jesus. Dr. Reagan: Well I think it is absolutely fascinating and I would like to go back to one of them you mentioned and that is the Pilate inscription that was found in Caesarea Maritime in the theater there when they were excavating it. And it appeared to me, I have seen this several times, it appears to me to be like the kind of plaque you would find in a post office in America that would say, “This Post Office was built during the time when Eisenhower was President, so and so was Governor of Ohio.” And that is basically what it says, Tiberius is Emperor, and Pontius Pilate is Governor. Dr. Fleming: Yes, it is honoring that Pilate built a Tiberium this was a site to honor Tiberius Caesar. Pilate is 26 to 36 AD, and so most people put the crucifixion about midway during his reign. But isn’t it great that we have that contact point with these characters mentioned in the story. Nathan Jones: Didn’t the stone end up in a very questionable place? Dr. Fleming: Recycled, it had probably been on a wall honoring this Tiberium, but when they were redoing the orchestra area of the theater that was simply used, Pontius Pilate ended up in disgrace, in fact he was banished in 36 AD and committed suicide in his banishment he was so ashamed. But that stone was simply used as part of a stairway for the platform and shaved part of the letters off so it would fit right and things. Dr. Reagan: Now, what is the significance of finding Pilate’s name on something? Is this the only place we found it outside, I think he is mentioned in the writings of Josephus isn’t he? Dr. Fleming: Yes, actually to find an inscription in stone with his name on it, it is the only one. Other ones may come up, although his reign was just that ten year period. We have many mentioning the Emperors of course, but the local Governors you don’t always find their names. Dr. Reagan: Now you mentioned the bone box of the ossuary of the High Priest Caiaphas. Boy that was quite a discovery wasn’t it? Dr. Fleming: Yes, now about 2,000 bone boxes have been found. Dr. Reagan: Let’s tell what a bone box is, most people don’t know. Dr. Fleming: You have primary burial and secondary burial. After the body decomposes, it sounds funny to us; the Jews would collect the bones. So bone boxes usually long enough for the long bones and wide enough for the skull. And a 1,000 of these bone boxes had names on them, a 1,000 no name. The relatives in the tomb of course knew who was in that box, but this gives us the common names in the time of Jesus. Now what is so great about them in Judea we don’t find them before 36 BC, and not after 70 AD? So we have this short 100 year period when their popular way of burying and it gives us, what are the popular names in that 100 year period. Dr. Reagan: In the collection of those bones into bone boxes, was that so the tomb could be used again? Dr. Reagan: Over, and over, and over. Dr. Fleming: And now, the body in Jerusalem’s climate takes about 2 years to decompose. In drier places like Jericho it would take longer. But it gives us for example; there are very few first names in this time. So a lot of people have the same names, and so like Simon is almost 20% of the people are named Simon. Mary is 40% of the women are Miriam, Maria. Nathan Jones: Like Deborah today. Dr. Reagan: Well you would see that in the Gospels with the Mary the mother of Jesus, Mary Magdalene, just goes on and on. Dr. Fleming: How many Mary’s there are! Nathan Jones: Now if we go back to the 1800’s and I am really excited, you read about the Hittites all over the Old Testament but no one knew about Hittites right, until the 1800’s. Dr. Fleming: Many people wondered is this Biblical fantasy or something? In Central Turkey, their capital has been found, and excavated. In fact very important discoveries were made at a place called Ugarit on the western coast of Syria, called the Ugaritic Tablets, vassal treaties between the Hittites and their weaker neighbors a strong king and vassals. The Hittite vassal treaties from the 1200 and 1100’s have the same 7 points to them as the outline of the book of Exodus. Dr. Fleming: Which means the book of Exodus is a treaty between a people and their God. And it is written in a way that everyone is going to see that this is a covenant, it is a legal document. Nathan Jones: It sounds like again, and again and again archaeology proves that the Bible is historically accurate. Dr. Reagan: I want to ask you about one of my favorites. Dr. Reagan: That is books written around 1800 which argue that the Bible was full of myth, legend, and superstition and the proof positive was that Jesus spent 3 1/2 years of His life preaching in 3 towns that never existed. And those towns were Capernaum which was His headquarters, Chorazin, and Bethsaida. And yet archaeology has since found all three, right? Dr. Fleming: Yes, and that is great because the Bible has been put on the map. There have been so many excavations, or at least surface surveys to know what period of pottery you find at a site, that we know where 25 of these 27 towns are in the Gospels now. Dr. Fleming: We are still not sure in John’s Gospel, John baptized from Bethany of Jordan as far as Aenon and Salim we are not sure about Aenon and Salim, yet. Dr. Reagan: Do we know where John baptized for example where Jesus was baptized? It would be in the southern part of the Jordan River. Dr. Fleming: Well John’s Gospel says he baptized from Bethany of Jordan. There are some who think that Bethany of Jordan may have been closer to the Sea of Galilee but your main disadvantage there is that from His baptism He was led up into the wilderness of Judea. And John’s message was in the wilderness, right, declaring in the wilderness the coming of God’s message. And so for that reason almost all scholars feel that Bethany of Jordan was just were the Jordan enters the Dead Sea near Qumran. Dr. Fleming: Camera shooting in the middle, you will have to clarify photographs, yes, yes. Dr. Reagan: It is totally barren, just as barren as can be. And we came back and showed this in the states at a premier and people came up afterwards and said, “I never had any idea that it looked like that. When I think of a wilderness I think of a thickly forested area.” And they had always thought that Jesus went out and spent his time in this thickly forested area instead of a barren wilderness. Nathan Jones: Like the little sheep tracks all along the sides of the hills. Dr. Fleming: And it was it did have predator animals but they would be lions, they would be leopards, there are still a couple of leopards there, wolves, it is a dangerous area. That is why John’s Gospel said in that wilderness that even wild beasts did not harm Him. But don’t think of a forested wilderness. 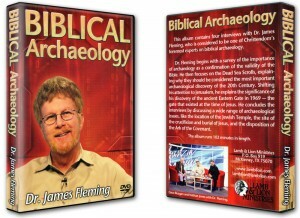 Dr. Reagan: Welcome back to our interview of Dr. James Fleming who is considered one of Christendom’s foremost teachers of Biblical Archaeology. Nathan Jones: Dr. Fleming could you tell our folks how they can get in touch with you, and your ministry and find out all about that great Antiquities Center. Dr. Fleming: Oh, thank you, yes we have a site called digging4it.net, and that will get onto our museum site in Georgia as well as our educational materials. Dr. Reagan: I love that website name, digging4it.net; you can either spell out the word four, or put the number 4 in there. Digging4it, and that will open up a whole new world for you, so folks be sure you go there. Jim, you became famous in 1969 when you discovered the location of the Ancient Eastern Gate in Jerusalem. And I have always been fascinated by the story and I was wondering if you would come back next week and share the story with us of how you did that. Dr. Fleming: Okay, okay. I will be glad to be with you.